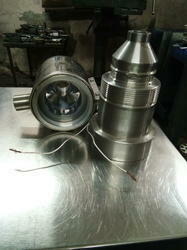 We are offering Flexible Hose Pipe Dies to our clients. Usually used to cut threads in a hole that has already been partially threaded using one of the more tapered types of tap.Can be installed on the die wrench or machine tool to manufacture the thread, is easy to operate. Symbolic to all the success we have acquired in the industry, remains our status as a prominent enterprise engaged in offering Pipe Die Set. Our organization offer manufacture, supply and export a robustly designed assortment of Pipe Die Sets which is available in many sizes, dimensions and specifications. 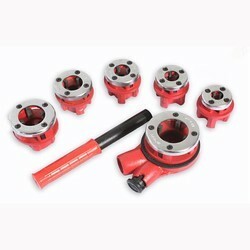 These Pipe Die Sets are manufactured from deft engineers as per the set domain norms from latest machinery and superior grade raw materials. We are a unique entity in the industry, actively committed towards manufacturing a qualitative range of Pipe Die Set. No. Of Pieces (Kit): 1/2" TO 1"
Tools Available (Kit): 1/2" X 1", 1 1/4' TO 2 & 2 1/2" TO 3"
Size (mm): Price Per Pc.